There’s something I find very satisfying about trivia games. Maybe I just need to prove to myself that the random scraps of knowledge I’ve accumulated in my mind mean something. Or maybe trivia creates an unparalleled group experience. Everyone knows some trivial knowledge, and trivia games allow you to find out exactly what knowledge your friends have. This can be surprising and funny! It helps everyone learn about each other in the confines of friendly competition. For me I think it’s more of the first thing. Trivial Pursuit is the trivia game staple for many households, but it is plagued by a few incomprehensibly bad design decisions–needing to roll exact numbers to do something on your turn primary among them. Answering random trivia questions is fun enough, but Trivial Pursuit manages to make that experience actively worse. Additionally, many of the questions are time-contextual. I remember becoming very frustrated with my family’s old copy of Trivial Pursuit as a child because I never knew any of the early 80’s pop culture questions. Here to improve on the trivia concept is Power Grid designer Friedemann Friese, a man obsessed with the color green (that’s not a joke–look it up). Terra is the second implementation of Friese’s trivia game system, first used in Fauna back in 2008. 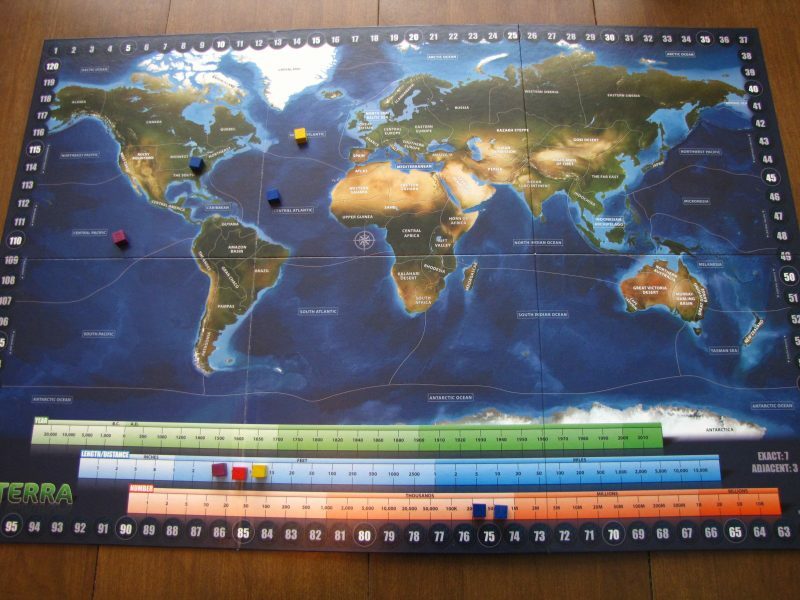 The game comes with a map of the world, sectioned off into regions, and three, for lack of a better word, number lines at the bottom of the board. In each of the 6 rounds, a card will be drawn showing some kind of monument, event, location, etc. The card will then specify what aspects of that thing the players will be guessing. For example, you might draw the Terracotta Warriors and need to guess where they’re located, how many there are, and what year they were discovered. Players then go around, in turn, placing a cube on the map or on one of the number lines to take a guess on any of the applicable categories. The number lines are measured in ranges. So if you think something happened in 1983, you’d put your block between 1980 and 1990 to capture the entire range. What a game might look like mid-round. Once everyone has finished placing cubes, the answers are revealed, and everyone who got an answer correct gets 7 points. On top of that, every answer adjacent to the correct answer grants 3 points. Every cube that scores points returns to the players, and cubes that didn’t score are discarded. Everyone then gets one discarded cube back, and a new card is drawn. It’s a neat and tidy system that works fairly well. First of all, it lets everyone participate in every question, so you never have to wait your turn to get a question or get frustrated because you don’t know the answer to the question drawn for you, but you knew all of the other answers. Second, it lets people participate even if they don’t know the answer. They can take educated guesses or leech off of their friends who appear confident in their answers. So it’s certainly an improvement from the Trivial Pursuit model, but I don’t feel like it’s the one modern trivia board game to rule them all. The most disappointing aspect is that in a 45 minute to 1 hour game, you’re only going through 6 pieces of trivia. Granted, you get three pieces of information on each card, but it feels somewhat sparse. If I wanted to absorb a lot of interesting information I’d rather watch an episode of Jeopardy, which gets 50 trivia questions out in 20 minutes. The game also walks a fine line with regard to the difficulty of the questions. It works best when the players don’t know the exact answers but know enough to take educated guesses. That’s a hard balance to strike. If the answers are known that provides a severe first player advantage, but if no one knows anything about them, it becomes a game of frustrating blind-guessing. In my experience, somewhere around 50-75% of the cards strike the proper balance. The cube management part is also underwhelming. You begin with 5 cubes to place and can never go below 3, so there’s never much of an incentive not to use up all of your cubes each round. The only time I would do so is if I was very confident that there were no more point-scoring spaces available and I had at least 3 cubes left. Ultimately that part of the game doesn’t really add much. Finally, I’ve encountered a couple of issues with questions being imprecisely defined. For instance, how does one measure the “length” of an atoll? Is it the widest diameter point or some kind of measurement from tip to tip, encircling the land mass? But Terra isn’t bad by any stretch. It provides a good trivia game experience that is more knowledge-inclusive than many others. 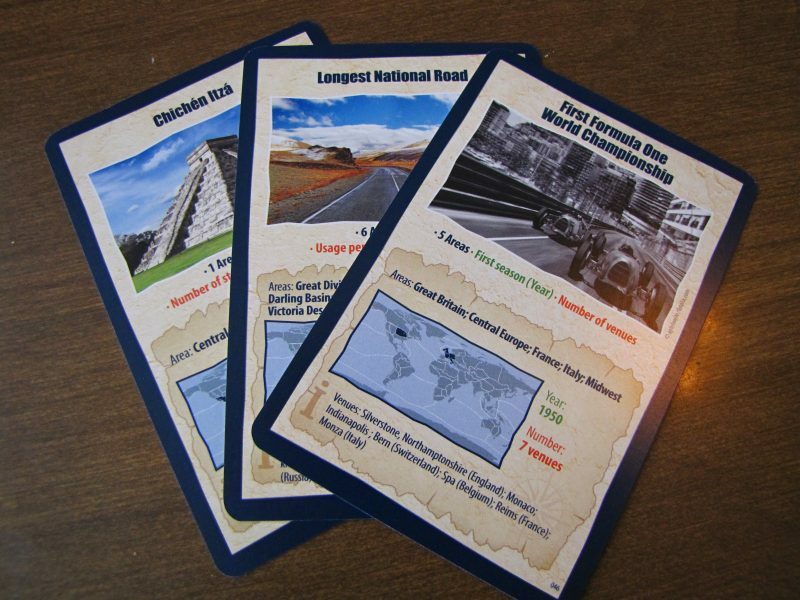 The cards have genuinely interesting information on them, and I could definitely see this used by parents or teachers as a way to excite kids about cool features of our world. And you will very frequently be surprised by some of the correct answers. As a game to play with a wide range of gamers and non-gamers, it works. As a game to play at the end of the night when you’re too tired mull over a complicated Euro? It’s fine. But sometimes I’ll go to a trivia night at a local pub with my wife and some friends. Together we work together to try to figure out the answers. We use our varied knowledge bases to accomplish more than we would be able to do individually. The atmosphere is lighthearted and fun. While Terra is just the game itself and not the atmosphere, I think that pub trivia system is simply better.